Gary Dvorchak’s move to China in 2013 was not random, as his family impacted Xi Jinping’s early career. Xi visited Gary’s hometown in Iowa in 1985, leading a delegation studying agriculture. During three days in Gary’s hometown, his parents hosted Xi, and he slept in Gary’s bedroom! In April 2015, Xi warmly welcomed Gary’s parents on a visit to China. The family was honored with a private, two-hour dinner with the First Family. Xi really does consider his hosts old friends. 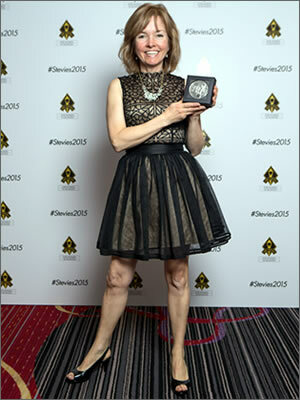 Kathleen McQuade Ellmore, Silverlink’s vice president of engagement sciences, took home a Silver Stevie Award for the Maverick of the Year category at the 12th Annual Stevie Awards for Women in Business. The Stevie Awards for Women in Business are the world’s top honors for female entrepreneurs, executives, employees and the organizations they run. After 21 years with Procter & Gamble, Daniel Epstein moved to Toronto three years ago to marry Heidi Philip and be with her and her two boys, Lucas (12) and Theo (9). He has been teaching Brand Innovation Strategy in the Rotman MBA program at University of Toronto and consults in how marketing and innovation best practices are changing because of what is being learned in cognitive and behavioral science. He would love to hear from anyone else working on or interested in the future of marketing. Bryan Sadoff has been living in Milwaukee since 1997. He has been married to Alicia since 1992. They have two boys (19 and 16). He owns Sadoff Investment Management, financial advisory firm, managing about $1 billion. He is proud to have made Barron’s and Financial Times’ top lists. Also, he is the chair of YPO-Wisconsin chapter. He’s doing volunteer board work, one with classmate Tom Price ’92. He also sees fellow grad, Bob Honigberg ’92 in Milwaukee. Life is good!